It was the first time you heard complete silence at the World Cup. 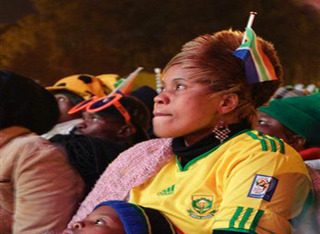 The vuvuzela horn, which had previously been a non-stopping sound of South Africa, had stopped. And you could have guessed someone had been murdered on the soccer field to stun the fans… and quite frankly it was murder… murder of the Bafana Bafana. South Africa, known as team Bafana Bafana, fell victim to one of the most disgusting plays in soccer… a dive by a Uruguayan player inside the penalty area. Inside the 18-yard-box, the goaltender for South Africa Itumeleng Khune reaches with his leg to stop Luis Suarez who trips over Itumeleng’s toe. But if you watch this play in slow-motion replay, it’s easy to see that Luis had made up his mind before even being touched that he was going to fall down and pretend to be hurt. The dive allowed referee to call a penalty shot, and much worse, a red card for Itumeleng because of Luis’ position of being right in front of a wide open net… and a sure goal. The penalty shot was taken by Diego Forlan who made no mistake. The goal silenced the home crowd who looked stunned in the cold South African winter. But it couldn’t be a more bitter situation as their team was now down a player and behind by two goals. What is even more disgusting is that everyone, broadcasters, critics, players, are all saying that even though it is obvious that Luis dove and acted hurt to persuade the referee to make the call… it was a penalty. No one is talking about giving Luis a penalty for the dive. And if you thought it couldn’t get worse… it did. South Africa, down to 10 players with 10 minutes left in the game, had a chance to score. Bafana Bafana player Siboniso Gaxa had the ball inside the Uruguayan box, and made an obvious dive to draw a penalty shot. Diving is contagious. If Uruaguay profits from a dive, then South Africa abandons their honest game plan to join in on the dishonesty. Uruguay ended up winning the game 3-0. They were the better team with more skill and talent, but the dive by Luis demonstrated that even the most skilled teams cheat to win. This type of cheating is nothing new in soccer. How will it ever stop? Is it possible? What do you think? Let us know in the comments below? Are You Watching The World Cup? For sure - I'm a soccer fanatic. I'll watch the final game, but that's about all. No, I'd rather play soccer outside. No - I'd rather watch baseball or the NBA Finals.